We are building a Living Library of the Arabian, Anglo, and Part Bred Horse. We would like to invite people to contribute to this new section. So we can create a Library that grows each year and contains the valuable information about our wonderful horses. We all know there is a wealth of information out there, our forum is a testament to that, now is our chance to put all this together into a place that is easily accessable and searchable for One and All. If you would like to be involved, have that valuable knowlege and would like to share it, then please do let us know. I'll be providing an over of M Lloyd's Anglo Arab's breeding and pedigrees for this living library but it'll take some time to complete. She began breeding from her TB Ona Dollar (claim to fame once race ridden by Lester Piggott) in 1970s and she was her foundation mare. Her horses were versatile and expected to combine ability, tenacity and attractive to the eye. My childhood and teenage years were spent growing up with a rich tapestry of home-bred horses, pedigrees and stories. I guess it's time to record Margaret's story - factual information, photos and bloodlines etc for the living library as noone else has this knowledge. El Sabio (sired by her stallion El Prendero) represented GB with Annette Masterson recently so Margaret's breeding is still relevant. 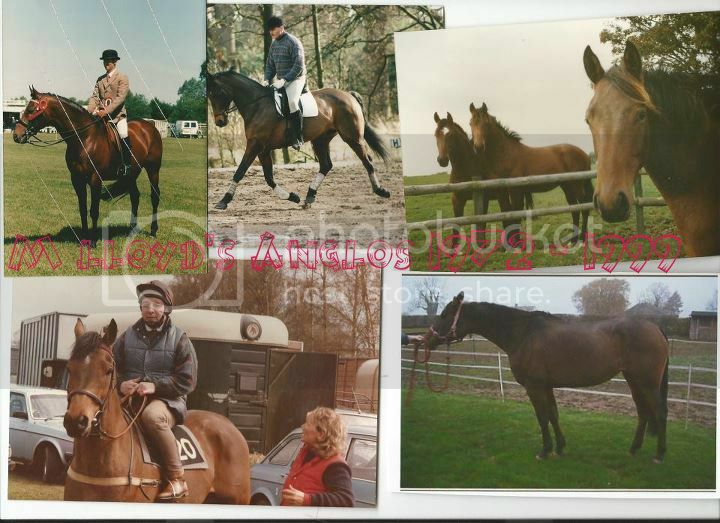 A photo my recent acquisition, a pure bred arab (taken from her sale details) sneaked into this collage - originally it was created to show the similarity of my Russian/French arab with Margaret's 'stamp'. I'll be working slowly on this project over the next 6 months or so. You may spot Richard Pitman on her anglo 'El Trapero' taken on a race training day. yes it is Seyhal, Fakhr el Kheil x Selmah, same colour as Kheil (but not same shape !) He belonged to Hassanein al Nakeeb at this time. the grey ridden horse has an Indian Silver-y look about him, who was his son- the sire of Silver Satyr, could it be him ?? Information on strains would be good eg seglawi etc. Not sure what I can do to help, but if there is anything please let me know. Ideas of the categories/topics would be a great start. We can then have areas ready for info uploading etc etc.. Sorry, that should read Numbbum! Would like to submit to the part-breds and pure-bred and proof read if required. To go along with Plumbum most info will be historical!!! If you have a specific category you would like to research/contribute to please start a topic.. then it can be used to ask for " more info / help in research/ photos " etc etc.. ready for when the software is up and running. Obviously we can all contribute to all categories as well but some people may prefer to specialise. This is a fantastic idea. Happy to help if I can. I'm quite old so I have a few memories..............If I can remember them! Please do start threads on specific ideas, the more the merrier. Happy to be of assistance. this sounds a wonderful idea, especially with all the pictures and everything and I can't wait to see it. not sure what I can do to help but if there is anything please let me know! Im happy to help in anyway that i can.